REVIEW: MSG LIONHEART 2 IS HILARIOUS! Watch the Rockstar Baba's latest film only if you need some comic relief, warns Prasanna D Zore. Baba Gurmeet Ram Rahim Singh Insan's Hind Ka Napak Ko Jawab: MSG Lionheart 2 is absolutely hilarious. Watch it only if you love comic strips or have nerves of steel lest you get singed every single moment of the 135 minutes that the Baba takes to annihilate the jihadis across the border. 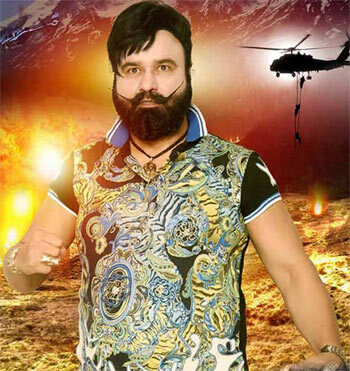 But wait, there is more to HKNKJ: MSG LH 2 than the most lethal anti-jihadi on Planet Earth. The plot is as simple as they come. Baba is the Chosen One -- even the Indian Army and its chief is sidelined -- and the Indian government deploys this cobra-esque missile to destroy the enemy state's prime minister, and cartoon-like lookalikes of Syed Salahuddins, Maulana Masood Azhars and Hafiz Saeeds. To achieve his mission, the Baba dons the avatar of a maulvi, falls in love with a Balochi girl, forges a marriage, becomes a Pakistani army officer, and reduces the jihadis, including the Wazir-e-Azam, to cinders. In between all this, the Baba gets time to sing romantic songs, cavort with his leading lady, and most hilariously: give a lecture on jihad to jihadis in their own backyard. Considering the Baba's pompous film-making style, one would rather not dare ask or write about the other credits in HKNKJ: MSG LH 2. For, if he had 30 credits to his mighty name for his first film MSG Lionheart, for HKNKJ: MSG LH 2,Baba's credits stand at 43. If Baba could, he would have donned the as his own leading lady too! After reducing the jihadis to ashes, you believe the film is over and done with. But trust Baba to rub it in further with -- just like in MSG LH -- aliens becoming a part of the proceedings! For the time being, Baba is in the safe custody of the aliens, who have taken him prisoner, caged him in a spiral of fire, as the film climaxes with 'To be Continue' (no typo here). Watch HKNKJ: MSG LH 2 only if you need some comic relief.